Just minutes after landing: expedition 33 Commander Sunita Williams of NASA, right, and Flight Engineers Yuri Malenchenko of Roscosmos (Russian Federal Space Agency), and Akihiko Hoshide of JAXA (Japan Aerospace Exploration Agency), left, sit in chairs outside the Soyuz Capsule in a remote area outside the town of Arkalyk, Kazakhstan, Nov. 19. 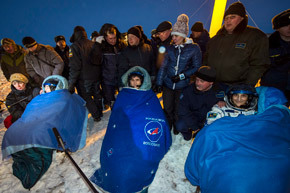 Williams, Hoshide and Malenchenko returned from four months onboard the International Space Station. Source: Bill Ingalls/NASA.